Future fins will radically change your surfing performance. Your speed and style, your whole surfing experience, will change with the right Future fins. 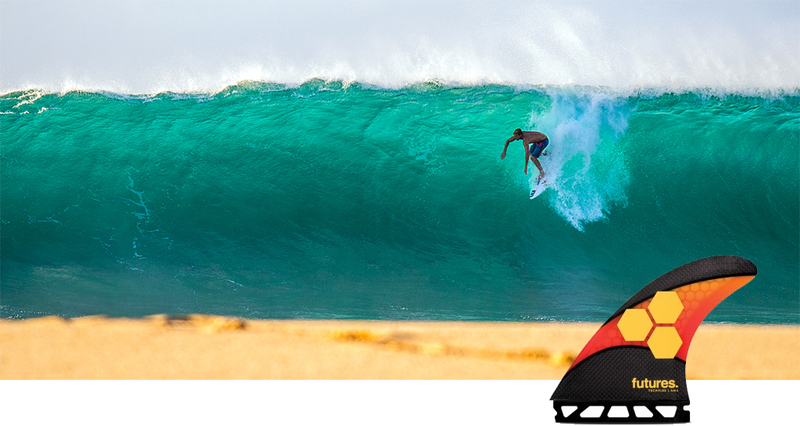 But how do you choose the right setup to progress your surfing? There’s such a huge variety of alternatives. They’ve taken the trial and error, the hit and miss out of the equation. They’ve made getting the right fin as easy as choosing a number. While some people will choose a fin on colour, there’s actually a considerable number of scientific characteristics that give a fin its feel. There’s too much detail to go into here but Futures has taken all the metrics of all those characteristics and resolved them to a number they give to each fin. Starting at 10 and going down to 1, the Ride Number makes it easy so you can choose the fin for the feel and performance you want. 10, will give you speed generation. A 10 fin is super responsive. It’ll flex with a lively feel squirting you in and out of turns. So you pump, get speed, and feel like you’re in a slingshot. 1, will give you speed control. A 1 fin will direct and control wave power driving you down the line so you do longer arcs and carving turns. Between 10 and 1 there’s the middle, either side of 5. Fins with these Ride Numbers will be good all-rounders. John John Florence is a great case study to see how well the Ride Number works in getting your fins right. I know we’re not all John John, but it’s relative. John surfs against his peers on the World Tour and performs consistently better. In the same way Futures will help you perform consistently better when surfing with your local crew. John rides his signature Futures Tech Flex model fin. It comes in 3 sizes: Small, Medium, Large. In 2016 he chose to ride the Medium with a Ride Number of 5.5. What does this Ride Number tell us? It’s in the middle of the Ride Number range so should help you surf better in all round surf. That’s exactly what it did! Check the World Surf League, WSL, videos of John’s 2016 heats. In most heats the waves were just okay, like the waves we surf most days, not too big, not too small, sloppy with odd good sections. In those conditions John had the edge over his peers with fins dialed in to perform in those all-round conditions. The result? Before year end John had won his first World Title on his Futures Tech Flex fins with a Ride Number of 5.5! John’s coach, Ross Williams, wanted John to display more power recommending a larger fin so John still used his signature fin going for the Tech Flex Large with a Ride Number of 3.7. What does this Ride Number tell us? This fin will give you the best performance in more powerful waves. Giving you drive and control of the power. Check the WSL coverage of the heats John surfed in 2017. The waves were bigger, cleaner, way more powerful. Commentary on John’s surfing, especially at Margaret River, describes it as next level. John had the perfect Futures fin to match the conditions, and his power and control were on full display. John won the 2017 World Title. John’s results show Futures’ Ride Number works, it’s a proven way to indicate what fin to choose for how you want to surf. Want speed and want to pump, use a higher Ride Number. If it’s punchy and powerful and you want to carve and control use a lower Ride Number. When the waves are average and you want to surf your best, use a Ride Number in the middle range. Future’s is a surf technology innovator. Their new Alpha material revolutionises fin construction. Futures can fine tune any characteristics any way they want. For example graduating thickness, or adding concave or convex, or changing density, anywhere. They’re no longer bound by the constraints of traditional construction methods. In addition, Futures can texture their fins. Smooth areas for bite, finely textured for flow, greater texture for speed or release. So you get a fin that delivers revolutionary performance. Just to let you know John John has also created his own Alpha version to add to his signature collection. The Futures range includes fins from the World’s greatest surfers, big wave to free surf surfers, shapers and designers. There’s great colours too. 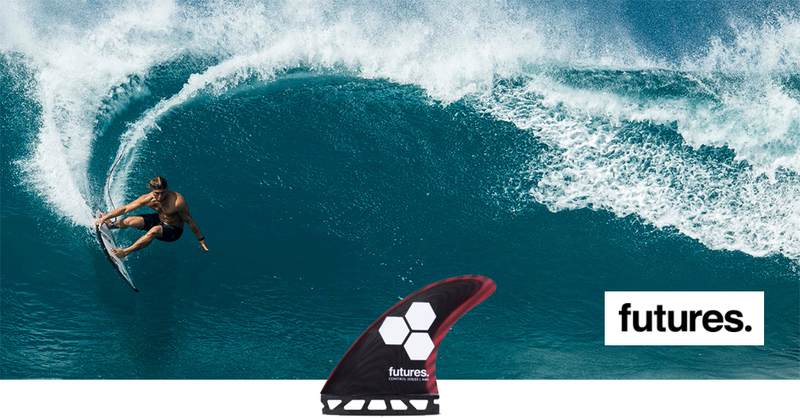 To check all our great Future Fins gear and buy online click here.